As New York continues to bask in the feel-good energy of last weekend's marathon (and proceeds to collect and tear down the miles upon miles worth of gates and barricades scattered throughout the five boroughs), many of us spectators have started to think about hitting the gym and possibly gearing up to run a marathon of our own. But if you've thought the number of people running marathons seems to be on the rise, you're right! There's a reason everyone has a former roommate or an uncle or a handful of co-workers who are constantly training: more than half a million people complete American marathons each year, and adjusting for events like natural disasters, the number of participants has steadily been on the rise. Besides being a world-renowned mathematician and code-breaker, Turing was also an avid runner. He even tried out for the 1948 British Olympic team, coming in fifth in the trials. A Brit took home the silver that year with a time of 2:35:07—if he'd been in that race, Turing's time would have landed him in 15th. The popular host of NPR's "Wait Wait... Don't Tell Me!" also writes a column for Runner's World on his many multi-mile endeavors. In 2013, he acted as a sighted running partner for a visually impaired man during the Boston Marathon—they finished together just five minutes before the bombs went off. "BOOM. An enormous noise, like the most powerful firework you've ever heard, thundered from behind us. … Another BOOM. White smoke rose in a miniature mushroom cloud into the air, a hundred yards away, just on the other side of the finish," Sagal wrote the next day. "I had just finished my 10th marathon, my third Boston, and I had never heard anything like that. Ever. Cowbells, music, cries of pain, sure, but never that." Winfrey is often credited with the 1990s and 2000s upswing in marathon participants—she'd vowed to run one before she turned 40, and when the Queen of Daytime Talk Shows says she's going to meet a goal, you know it's going to happen. She ran 26 miles in a downpour, with two National Enquirer reporters tagging along beside her. The newly elected Speaker of the House caused quite a stir back in 2012 when he told a radio program that he ran a sub-three-hour marathon—a feat relatively few amateur athletes can claim (though former CIA director David Petraeus ran a 2:50:53 in Omaha in 1982). Turns out, he lied; or, misremembered, as his spokesperson said. The then-20-year-old college student had run the hilariously titled Grandma's Marathon in Duluth, Minn. in just over four hours, a time former New York governor Eliot Spitzer (who ran a 3:58:44 in NYC in 1983) made sure to write a full article in Slate to point out: "A sub-4-hour marathon is possible for a determined but not-too-talented runner. Sub-3 requires real talent." You know who did nearly run a sub-three-hour marathon though? Sherlock. No, not the Cumberbatch (though he did quite a bit of running when he played the aforementioned Alan Turing in The Imitation Game). Elementary's Sherlock has not only run more than 15 marathons, but he's also completed a number of ultra-marathons, including one 50-miler this past spring. That solves the case of his 26.2 tattoo! Puffy (then P. Diddy) trained hard for his hometown race—and he fund-raised hard too. The rapper raised $2 million for New York public schools and children in need, wrangling his celebrity friends like Ben Affleck, Jennifer Lopez, and Mayor Michael Bloomberg to kick in. One of his self-proclaimed "Diddy Runs the City" goals? To beat Oprah's marathon time. "I've never experienced mental or physical pain like that," Combs, then 33, told reporters after crossing the finish line. "But it was a beautiful experience." Everyone's favorite TV teacher began training for the New York City Marathon when he was a young actor in the city who had just been fired from a soap opera gig. Sulking around, he happened upon the finish line and later told The New Yorker that he was so inspired by the “old people, children, people in bunny costumes, people who’d lost their legs, this amazing menagerie of humanity” who were finishing the race, that he began training immediately to run the following year. 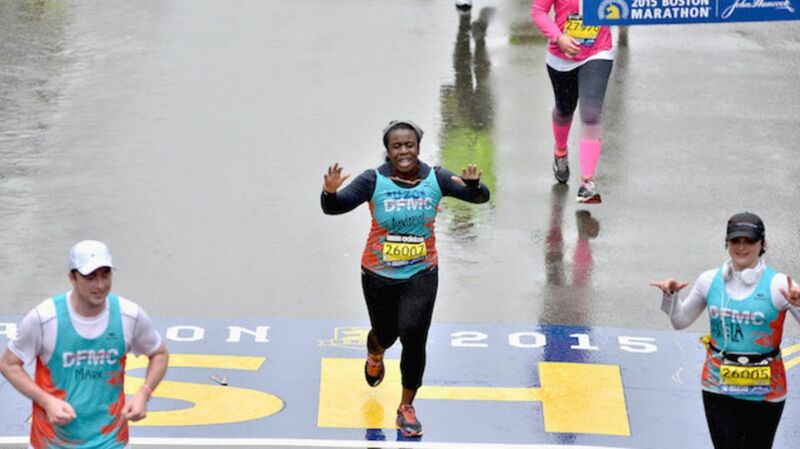 Aduba has won two Emmys for her role as "Crazy Eyes" on Orange is the New Black, and for this year's Boston Marathon, she put her celebrity to use and ran for the Dana-Farber Cancer Institute. As Aduba told Women's Health, she lost a woman she described as a "second mom" last year to cancer. And not only did this woman help her realize her dreams as a child, she gave her a playlist for life. "When I think of Andrea—talk about a fighter—when she passed away, the song that was most played on her iPod was 'Brave' by Sara Bareilles. I love that song so much. I run to that every single day, and I'm going to run to it … when I'm coming through the finish line. … I'm going to listen to that song because that's the song she was fighting [for] her life with, that was her motivator getting through every single day of treatment, every single round of chemo, that was what she was listening to constantly. And I listen to that when I'm training now, and I can hear her telling me, 'Keep going.'" The famed Japanese author and one of this year's TIME 100 Most Influential People didn't start running until he was in his thirties. Since then he's completed ultra-marathons and written a best-selling memoir about running, 2008's What I Talk About When I Talk About Running. His takeaway? "Pain is inevitable. Suffering is optional." Though quite a number of presidential contenders have run marathons (Sarah Palin, Al Gore, and Michael Dukakis among them), George W. is the only president who has one on the books. Bush was 46 when he ran the Houston race—two years before he became governor of Texas—and he continued running while in the Oval Office. "I believe anyone can make the time [to run]," he told Runner's World in 2002. "As a matter of fact, I don't believe it—I know it. If the President of the United States can make the time, anyone can." Plenty of professional and Olympic athletes have decided to go the distance with a marathon, and most soon realize they have to completely revamp their training techniques. Eight-time Olympic speed-skating medalist Ohno was no different. "I went from short, ballistic-type one-and-a-half minute training to something that lasts 3 hours, 24 minutes longer," he told Extra after the race. "The last 6.2 miles are gruesome, my body isn't designed for this." You can always count on Ferrell to put things in perspective. "Running a marathon is not a question of whether it will be painful, but when it will be painful," he said after completing Boston, his third marathon (he's also run NYC and Stockholm). A few years later, he noted, "People are terribly underwhelmed when they recognize me in a race. There’s nothing funny going on. It’s just a lot of silence and pain."